In 2008 I was blessed with the opportunity to teach a class for students with multiple and severe disabilities in grades Kindergarten through second grade. Unfortunately I had to leave this teaching position at the end of October as my own disability progressed and I became seriously ill. However, in the two months that I taught this amazing class of children, I witnessed disablism in a public school that I had hoped was a thing of the past. At the beginning of the school year, the principal made it clear to me that it was a school tradition that I was to continue for each and every class and each and every grade level to visit my classroom to "see" my kids and ask whatever questions they might have- in front of my children! My children were to be used as a combination object lesson and in school field trip exhibit. I refused on the grounds that my children had the same dignity and respect as the other children in the building and were not attending school to be put on display. Also, my children may have significant disabilities but they have the capacity to understand when people are staring at them, when people are asking questions about them, and when people are talking about them and they deserve the right to not under go this experience. Every child is entitled to be treated as a child first and foremost. My students were more than cute little school mascots to be patted on the head in the hallways (I put a stop to that practice immediately as they were literally patting my children on the head!). We were a part of the school and a part of each grade we attended for class. Inclusion was not about a general education teacher being so kind as to let us visit their classroom daily, it was about being educated alongside peers who are typically developing and being one of the class. You are not "doing me a favor" by allowing my student to be included in your classroom. Talk to my student, ask them questions, engage them, give them access to materials. Let me know prior to that day what you will be doing so I can adapt the lesson and have accessible materials for my student so they can learn along with their peers. Your attitude as the general education teacher will impact the attitudes of all of your students towards my students. You set a huge example. My students do not want tolerance, they want acceptance and appreciation of both their differences and their countless similarities to the other students. On field day, I took my class out during the Kindergarten through second grade time and we participated in every single activity that I could modify or adapt. We were there to play alongside and with our peers. 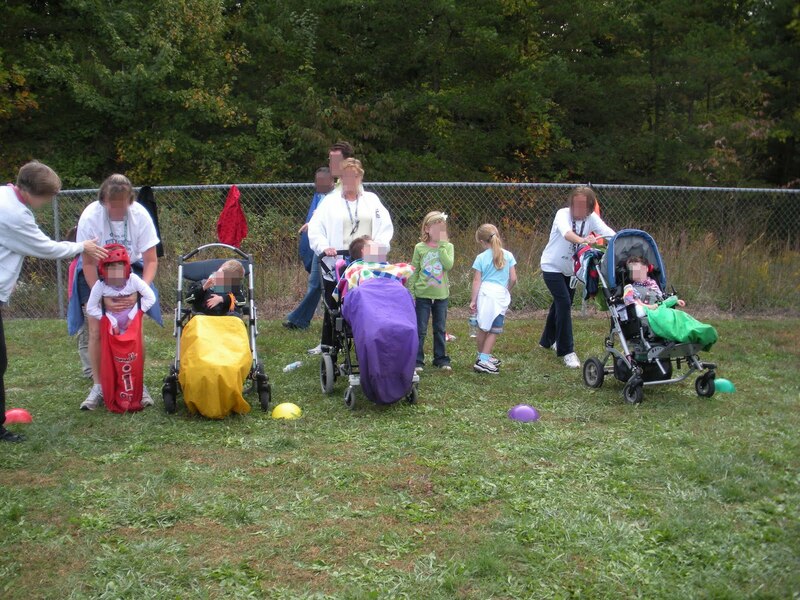 This shocked parent volunteers who felt that surely it was too dangerous for us to be running races with our children who use wheelchairs - although I am pretty sure that their boisterous laughter proved otherwise- and to be allowing our children to play T ball. Heck, this shocked teachers and administrators who informed me that in the past my class had always just come outside and watched the activities of field day but never participated. Just because my children used wheelchairs or had developmental disabilities did not mean that they did not thoroughly enjoy throwing a basketball at the hoop, tossing a football into the endzone, setting off air rockets, running races, playing with the giant parachute, or running our own version of the sack race as pictured above. We were not there to be school mascots, we were not there to watch, we were there to be included and I made sure that my children were not left out even as other teachers and administrators were left speechless. My students attended school for the same reason every other student attended that school: to learn, to grow socially, and to be appreciated as an individual. Tradition may have put us on the outside looking in, in the backrow of every assembly where we could not see and could not hear but also could not be seen, and on the sidelines. Tradition may have viewed inclusion as a favor, as a time when my students went and sat in another classroom but were never a part of the action. Tradition may have encouraged the head patting school mascot view of my students. It was and is time that traditions change. My students are just as worthy of respect and dignity, as eager to learn, as social, as communicative, and as valuable as every other student. Every child is first a child, and should be treated as such. The labels used to categorize and separate children need to be left at the school door and education should focus on teaching all children to meet their needs and building a community where all are not tolerated but appreciated. yer, preachin' to the choir here! Here, here - I'm sure your kids missed you when you had to leave! These are the reasons that ANY child attends school. Such articulate advocacy is important. I hope that the lesson learned was learned -- even if it wasn't the one originally planned. Displaying people as object -- the learning experience of others -- is appalling. This is so important to say out loud as many times as we have to. Thank you for your advocacy. This should be required reading in every school everywhere!!! Awesome advocacy. Good that you 'get' it, so sad that so many others in your position don't. Agreeing with Terri - you could write THE book on this topic. Love the post and the attitude! You go girl! This great past and full of so much truth and wisdom. Thanks for letting them be kids. No way should they be sidelined! Wow, I can't believe these kids used to be treated in that way! That's appalling, and I'm so glad you were there, even if it was only for a few months, to do things differently. I hope the example you have set will be followed.